Following a recent structural transformation, BT’s in-house executive search team has also recognised its increasingly strategic role within the business. “We moved away from just servicing direct sourcing for our executive population. There is actually other value that we can add to the business through helping them strategise on workforce planning and what technology they should bring in, among other things,” Jon Ridout, Head of Executive Search at BT explains. The way they did this, was through bringing in a number of executive search professionals with a similar remit of business partnering, to help BT get a much more robust governance around how they identify, assess and engage with executive talent. “We often tend to forget that in the executive space, people know each other. But when it comes to referrals, we need to get away from hiring friends and family, and go out into our professional network to find someone who we really think is good.” A tool like Sixley can help address this propensity by providing a fully digital solution to the referral experience. Sixley is also providing a rewards system to motivate and thank recommenders, donating part of the referral fee to charity for every successful hire. “Retaining good execs is challenging because they will always have options out in the market, especially in the tech space. We used to be guilty of losing contact with the execs who left BT, losing their expertise and brand ambassadorship. Now we’re looking to change this with the help of Hivebrite.” With a similar functionality to LinkedIn, Hivebrite is an all-in-one community platform providing employers with individually-tailored tools they need to build, manage, and engage their alumni. “Video interviewing is a contentious subject for executive search. But if you do need to connect with people internationally, a tool like HireVue would be more efficient than the more generic video conferencing platforms.” In addition to its video interviewing feature, HireVue also combines video, AI and game-based challenges to assess candidates, keeping them engaged throughout the hiring process. “We should be able to automate basic admin tasks like scheduling interviews and booking rooms,” Jon explains. “Especially if we are operating in the technology sector, people will expect us to engage with such types of automation, and they may even question why if we don’t.” A tool like Spark Hire not only provides video interviewing solutions (although not as high touch as expected in the executive space, Jon believes) but it also allows candidates to seamlessly book their interview slot based on the interviewer’s calendar availability. Onboarding should be top priority when hiring into executive roles. But when notice periods can be as long as 6, maybe even 12 months, an automated tool like Hibob can help give new starters a real feel of the business, helping them set clear timeline and workflows and meet their teams before their first day. It can also save the hiring team time by streamlining administrative tasks associated with bringing a new hire on board. 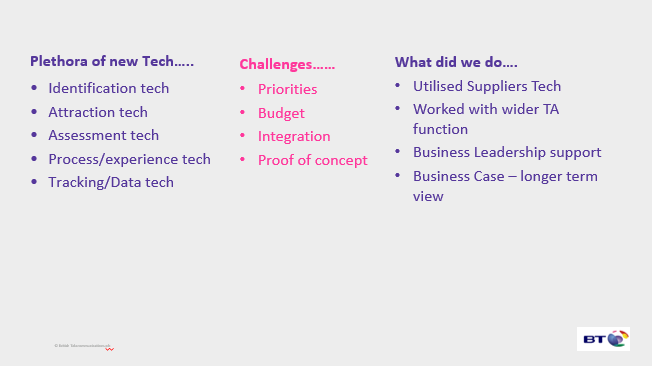 "BT's Approach to Technology in Executive Search"